Look out—these dogs bite! Hot dogs are wrapped in refrigerated flaky biscuits to make these fun appetizers. Pat hot dogs dry with paper towel. Separate biscuits. Cut each hot dog and biscuit into quarters; press biscuits to flatten slightly. Place 1 hot dog piece on centre of each biscuit piece; bring 2 opposite corners of biscuit over hot dog, then press points together to seal. 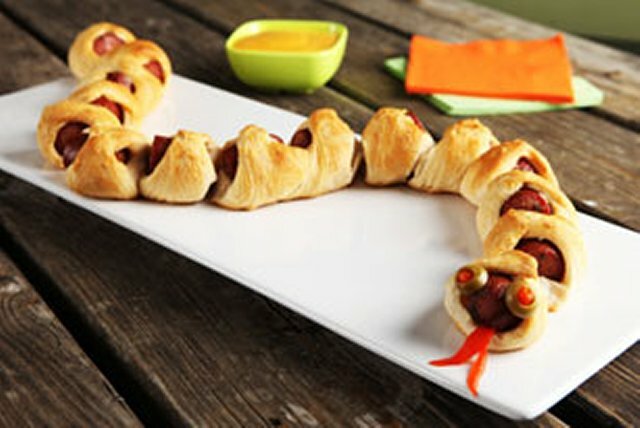 Arrange 16 wrapped hot dog pieces in "s" shape on parchment-covered baking sheet to resemble snake, leaving no spaces between pieces. Repeat on second parchment-covered baking sheet with remaining wrapped hot dog pieces. Bake 15 min. or until golden brown. Serve with heated Cheez Whiz JalapenoTex Mex Cheese Spread for dipping. Bake "snakes" as directed. Decorate with 4 stuffed green olive slices and 2 thin red pepper strips as shown in photo. Use kitchen shears to quickly and easily cut the biscuits into quarters.